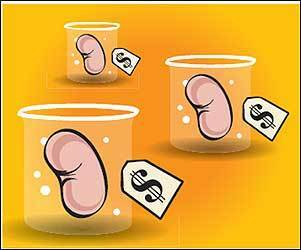 Why can't you buy a kidney to save your life? GIVEN THE MAKEUP of the Supreme Court, this is supposed to be a time when conservative judges are reining in some of the "rights" established by liberals over the past four decades. Yet there is a growing push in medical, legislative, and legal circles -- both liberal and conservative -- to recognize an expansive new right that some are describing as "medical self-defense." The movement is rooted in a desire to help patients who have run out of options. Some medical experts, including Dr. Emil Freireich, director of a leukemia research program at the University of Texas, have called on the Food and Drug Administration to let terminally ill patients try unapproved drugs that might offer their last chance at survival. And Republican Senator Sam Brownback of Kansas is working to introduce legislation that would force the FDA to do just that. Even more significant is a potential landmark case before the D.C. Circuit Court of Appeals -- brought by a group called the Abigail Alliance for Better Access to Developmental Drugs -- that could make access to unapproved drugs a full-blown constitutional right. Last year, a panel of three judges on the appellate court declared that patients with terminal diseases ought to have access to unapproved drugs, surprising many legal scholars. The case is now being considered by all 10 members of the court, and a decision is expected this year. The decision could have sweeping implications. A right to medical self-defense, some legal scholars argue, implies that there is a right to offer cash for human organs, if one is dying or suffering -- a practice currently banned. Such a right could even force the courts to overturn any federal ban on stem-cell research because, these scholars argue, the government's interest in protecting a 10-cell embryo could not trump the right of a Parkinson's patient to save himself. If you can shoot a man who breaks into your house at 1 a.m., they ask, why can't you try an unproven drug or purchase an organ? "There is a longstanding tradition of self-defense" in American law, says Eugene Volokh, a UCLA law professor and well-known blogger. "This tradition ought to logically entail defending yourself when doing so does not involve killing people." We're a ways off from such far-reaching implications, but interest in the notion of medical self-defense has been building in legal circles for some time. The concept received an especially clever and much-discussed defense by Volokh in the May issue of the Harvard Law Review. But even before that, John A. Robertson, a law professor at the University of Texas, and Yvonne Cripps, a bioethics specialist at the Indiana University School of Law, published articles linking the right to unapproved drugs -- and the fruits of stem-cell research -- to legal precedents involving self-defense and personal autonomy. Robertson also raised the question of whether there is a self-defense-derived right to medical marijuana. In their decision last year, the circuit court judges, by a two-to-one margin, relied on the notion that Americans cannot be deprived of "life, liberty, or property, without due process of law." They said the right to receive medical care is related to the right of patients to refuse it. But in his Harvard Law Review article, Volokh plays up two different arguments. For conservatives, Volokh stresses the you-can-protect-yourself-in-your-home right, one so robust in Anglo-Saxon law that the Supreme Court has hardly bothered to affirm it. There is ample precedent for the idea that radical steps can be taken when one's life is at stake. In an appeal to liberals, Volokh stresses an analogy rooted in the court's abortion decisions. Even then-justice William Rehnquist, a dissenter in Roe, conceded that late-term abortions were permissible if the mother was defending her life: Protecting the life of a fetus is not a strong enough state interest to overrule the right to save one's life. But if that is the case, Volokh asks, how could protecting the health of a patient who is terminally ill be an interest strong enough to outweigh the person's right to try a highly experimental pharmaceutical? And why shouldn't the person be allowed to offer to pay for a kidney, for example, if someone is willing to sell one? The inspiration for much of the new legal scholarship, including Volokh's, has been the suit by the Abigail Alliance, which eventually led to the court decision last year. Abigail Burroughs, who grew up in Arlington and Falls Church, Virginia, was an honors student at the University of Virginia who died of cancer in 2001, at age 21. She had sought access to a drug called Erbitux and never got it. Four years ago, the Abigail Alliance sued the FDA. Today, says Frank Burroughs, Abigail's father and the president of the Abigail Alliance, "There are tens of thousands of people in the same boat." A lower court dismissed the case. But last spring the three-judge appellate panel endorsed the group's claims. That one of the judges in the majority was conservative, and one a liberal, "was really quite energizing to me," says Volokh, a self-described libertarian. He saw the chance to build a left-right coalition behind the right to medical self-defense. Debate now rages over where to draw the line on this brand of self-defense. Some would keep it just where it is. Ezekiel J. Emanuel, an oncologist and chair of clinical bioethics at the NIH's Warren G. Magnusen Clinical Center, wrote in The New Republic last July that the D.C. Circuit Court's initial decision would send us "back to the snake-oil days." And a right to experimental drugs could undermine the whole drug-evaluation system: Why join a clinical trial if you could bypass it? More scholars draw the line when it comes to organ sales. Nancy Scheper-Hughes, a Berkeley anthropologist -- now in residence at Harvard's Radcliffe Institute -- has documented how wealthy organ brokers exploit the impoverished in places like Moldova and South Africa. She cites a moral parable to which Volokh himself refers in passing, turning it against him: A starving man adrift with others on a raft does not have the right to eat his fellow passengers. Scheper-Hughes suggests there is something of the same "predatory" aspect to organ sales -- a creepy assertion "that I have the right to the body of another person, to live." Volokh himself isn't troubled by poor people selling their organs, saying that they already work jobs at least as dangerous as selling an organ, like manning fishing boats. But he says that a law forbidding the extremely poor from taking part in the organ trade could be viewed as a reasonable regulation consistent with organ sales in general being a constitutional right. The generally conservative Volokh has also taken hits from the right. Robert F. Nagel, a professor of law at the University of Colorado, decries Volokh's argument as all too typical of a tendency among legal conservatives to become "simply a reflection of the left." No conservative should be building fresh rights on the foundation of Roe, Nagel says. Judicial overreach is judicial overreach, even if it serves libertarian ends. Volokh has become not just a commentator but a player. After reading his Harvard Law Review article in draft form, the Washington Legal Foundation (WLF), which represents the Abigail Alliance, edited its briefs to reflect aspects of his arguments. But his article's more provocative sections may also pose a problem for the medical self-defense movement. The WLF, for example, explicitly disavowed the section about organ transplants, evidently for fear of alarming conservative judges. "Clearly," says Richard Samp, chief counsel of the foundation, "that goes a lot farther than the argument we make." Christopher Shea's column appears regularly in Ideas. E-mail criticalfactulties@verizon.net.